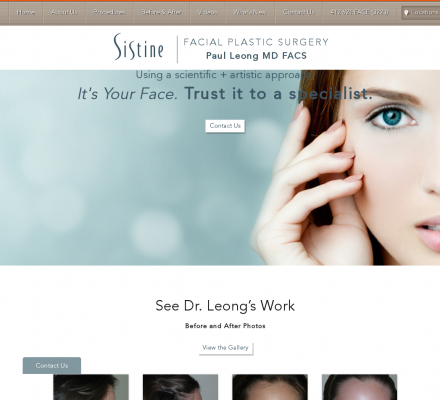 Sistine Plastic Surgery - Dr.
Dr. Leong is a double board certified facial plastic surgeon who specialized in procedures of the face and neck. He performs many surgical and non-surgical procedures and has 6 office locations around the Pittsburgh area. His surgical procedures include: facelift, rhinoplasty, blepharoplasty, otoplasty, earlobe repair, and chin augmentation. His non-surgical procedures include Botox/Dysport, dermal filler, tear trough correction, non-surgical rhinoplasty, Sculptra, laser resurfacing, ultherapy, lip augmentation, and laser hair removal. Description: Cosmetic Plastic Surgery Specializing in Facelifts, Rhinoplasty and Blepharoplasty in Pittsburgh, Pa. Dr.